Before modern medicine, one of the worst imaginable skin diseases was syphilis. The microbe that caused this disgusting sight and unbearable pain had different names in different places. In Russia it was called the Polish disease. In Poland it was the German disease; in Germany, the French disease; and in France, the Italian disease. The Italians blamed back, calling it the French disease. This brief anecdote speaks to a more pervasive truth about human nature: we love finding scapegoats. Assigning blame allows us to oversimplify complex issues. Assigning blame lets us find a villain that confirms our priors. Assigning blame is therapeutic. Once we identify the villain, we get to stop thinking. We reach a tidy conclusion that fits our worldview, and the case is closed. Except it doesn’t really make anything better. As Rosling puts it in his book, “This instinct to find a guilty party derails our ability to develop a true, fact-based understanding of the world”. A particular financial scapegoat that I’ve grown especially tired of hearing about is ETFs. The growing trend of investors using low-cost vehicles like ETFs and index funds has attracted many critics. There’s no shortage of scathing narratives: ETFs are a bubble! Indexing is worse than Marxism! Passive investors are parasites! We’re headed for a passive index meltdown! 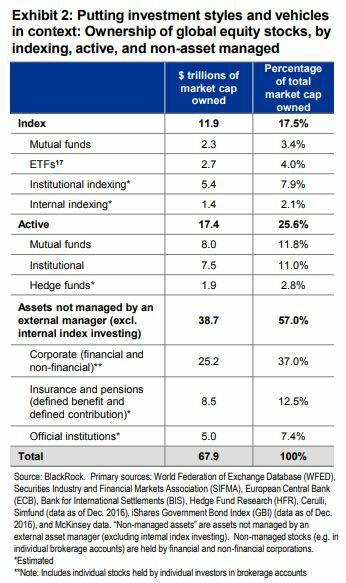 …the percentage of global stocks owned by ETFs and index funds is still relatively small. 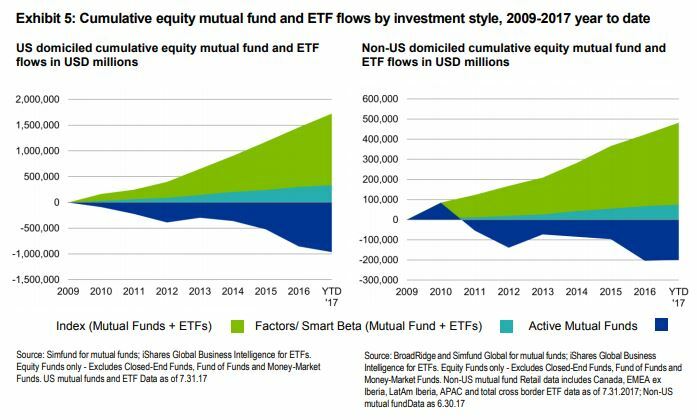 To say that we are approaching a point in time when ETFs and index funds overtake active stock selection seems a bit premature. One concern expressed by many critics of ETFs and index funds is that these investment vehicles are distorting prices by piling investors into all of the same stocks. It’s true that index funds and ETFs often own stocks in proportion to their market capitalization. However, many comparable active mutual funds own similar, if not larger, positions in the very same names. For that matter, there are still plenty of investors who own these stocks directly, without going through an ETF or mutual fund. Owning large and popular stocks is not mutually exclusive to ETFs or index funds. To take it a step further, another criticism of ETF and index fund investors is that they buy irrespective of fundamentals. I agree with the notion that ETF and index fund investors are largely price takers who opt-out of the “price discovery” process that active investors provide via trading. However, there are still plenty of active managers participating in “price discovery” every day. For example, BlackRock estimates that active stock selection accounts for roughly $10 trillion in trading annually. The majority of global stocks (roughly 82% per the figure above) are still owned by active stock selectors, and they are sufficiently active. The same BlackRock piece estimates that for every $1 traded by index funds and ETFs, active stock selectors trade $22. Price discovery is alive and well. Also, is it such a terrible thing that a portion of the investing public has admitted they do not have the skill, time, or inclination to participate in “price discovery”? I agree that there theoretically has to be a limit to how many people can decide to just index. I do not believe we are close to that threshold. In fact, I’m not sure we will ever get there because potential outperformance is too tempting. A final criticism of ETFs and index funds is that their holders are not truly passive investors. I agree with this assertion. 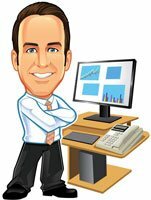 Not all ETF or index fund owners are of the buy and hold variety. When people want to sell, they are going to sell whether they claim to be active, passive, or (most likely) something in between. I’m not sure this is a knock on ETFs or index funds as much as it is a knock on human nature. People have been panic selling their investments since the beginning of time. This behavior will continue indefinitely, regardless of the wrapper assets are owned in. If ETFs did not exist, investors would just sell their active mutual funds or individual stocks during the next downturn. This behavior is not unique to ETF and index fund investors. As much as I disagree with it, there will undoubtedly be those who blame ETFs and index funds for a future market downturn. Our love of finding scapegoats all but guarantees this. Whether they want to call it the “ETF disease”, the “index fund disease”, or the “passive investing disease”, assigning blame for a complex situation is an oversimplified, useless exercise. ETF scapegoating tells you far more about those assigning blame than anything of actual value. While ETFs and index funds are generally a great tool for investors, they are not panacea. Investors still need to behave well or they risk forfeiting the cost and tax advantages these funds tend to offer. Additionally, there are still operational needs and important roles for active management to play for investors. Let’s resist the urge to find a scapegoat and accept that ETFs, index funds, and active management can and should co-exist in our investment world.